The Linus Pauling Institute (LPI) is a research institute located in Corvallis, Oregon, at Oregon State University. Major areas of research for LPI include cardiovascular and metabolic diseases, cancer, aging, immune function, and neurodegenerative diseases. 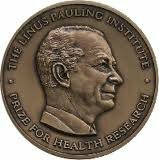 The institute is named after Linus Pauling, the only person to have received two unshared Nobel prizes (chemistry and peace). He was a scientific genius, and an original thinker who spoke his mind regardless of the consequences. Every person on earth is essentially in poor health. It's called "ordinary good health," but it ought to be called "ordinary poor health." Dr Pauling and several other colleagues founded the institute in 1973 in Menlo Park, as the Institute of Orthomolecular Medicine (the right molecule). After Pauling's 1994 death the institute relocated in 1996 to the campus of OSU, Pauling's undergraduate alma mater. The institute produces a free, semi-annual LPI Research Newsletter on micronutrient research. The institute sponsors several research awards, and promotes several outreach programs. Every two years, LPI hosts the Diet and Optimum Health Conference, and awards the Linus Pauling Institute Prize for Health Research, which "recognizes innovation and excellence in research relating to the roles of vitamins, essential minerals, and phytochemicals in promoting optimum health and preventing or treating disease; and the roles of oxidative/nitrative stress and antioxidants in human health and disease." Having the right molecules in the right amounts in the right place in the human body at the right time is a necessary condition for good health. The next conference is scheduled for May 15-18, 2013. The conference "will emphasize dietary and lifestyle approaches to improving human health and preventing or treating disease, including dietary supplements, micronutrients, and antioxidants." Scientists and health professionals in biochemistry, nutrition, preventive medicine, public health, endocrinology, cardiology, oncology, and gerontology should be lined up to attend. In addition there will be a public session entitled "Whole Food Approaches to Disease Prevention". Researchers at the Linus Pauling Institute investigate the role that vitamins and micronutrients, phytochemicals, and dietary supplements play in human aging, immune function, and the prevention of chronic diseases. An LPI major emphasis is understanding the role of oxidative stress and inflammation in disease cause and progression. They want to better understand the preventive effects of antioxidant or anti-inflammatory substances on our bodies. The goal of their studies is to understand how diet, micronutrients, and dietary supplements affect disease initiation and progression, as well as what role these aspects play in the prevention and treatment of human diseases. The concern of the studies is all about extending healthspan. The institute carries on research engendered by the inquiring mind of Linus Pauling and furthers the work of the father of molecular biology. The Linus Pauling Institute article, free nutrition content article, Healthy Aging Article, Healthy Living Article.